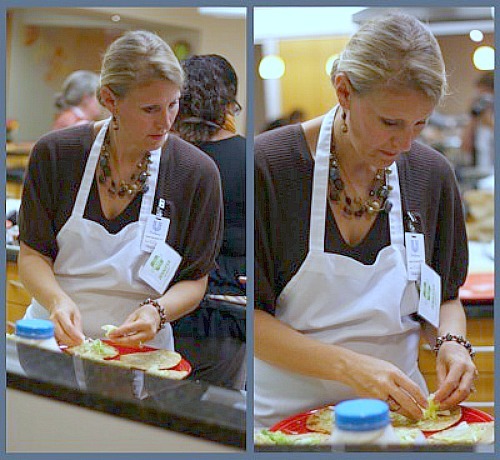 While visiting the Unilever Test Kitchen, each blogger was tasked with a different recipe to prepare. Stepping outside of my culinary comfort zone, I agreed to make something with shell fish, which typically, I do not eat. Not only was I impressed with how easy it was, but the presentation was beautiful. The blend of ingredients and flavors did not make it fishy tasting at all, and I got to brainstorming all the ways I could take this basic recipe and embellish it. This would be a perfect recipe for a special luncheon or dinner. 1. Combine avocado, onion, jalapeno pepper and red bell pepper, and crabmeat into bowl. Stir in mayo, lime juice and cilantro: set aside. 2. 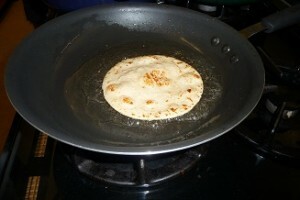 Heat oil in non stick skillet over medium heat and cook tortillas, one at a time until crisp, turning once. 3. Drain on paper towels. 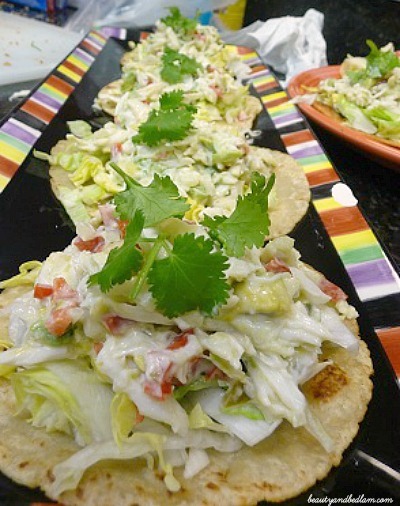 To serve, arrange tortillas on serving platter and evenly top with lettuce, then crabmeat salad. If you are not a shellfish lover, finely sliced chicken or turkey would be delicious in this as well. A completely vegetarian option could be made by adding more avocado, onions and bell peppers, and slightly seasoning it to taste. Enjoying it was a surprise to me. We talked about expanding our cooking horizons a few weeks ago with my Portebella Pizza recipe and I loved everyone’s comments on that. This recipe was another fabulous example of that. Go have fun and make this! That sounds wonderful!!! I love crab but my husband is allergic to shellfish so the chicken version sounds great! This sounds really good and easy. I agree this would be great for a luncheon or nice dinner. Wow, that looks as amazing as (I’m guessing) it tastes! I love fresh cilantro…so yummy! I make fish tacos with grilled tilapia so I’m sure I would enjoy this! I do enjoy crabmeat. 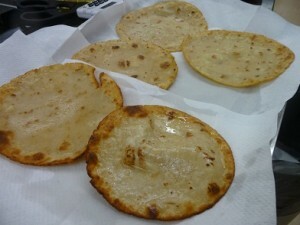 The meal looks delicious, but I believe they are called tostadas. They are an awesome, easy meal that you can pretty much pile anything on! Ooo, that looks quite yummy. I made something similar with canned salmon once and was quite impressed how well it actually worked with tostadas.